The “rhizoshpere” is the world of plant roots – a region of soil located just below the surface of the earth. It sounds like a fantastical realm, full of secrets and mystery – and to botanists and agronomists concerned with the issues of food security and climate change, plant roots are indeed a subject of great fascination. Yet, when studying dark, underground environments, how can you truly know what is going on under the surface? A team of scientists at the James Hutton Institute at the University of Abertay Dundee in the UK have developed transparent soil that allows researchers to stare deep into the hidden secrets of plants. 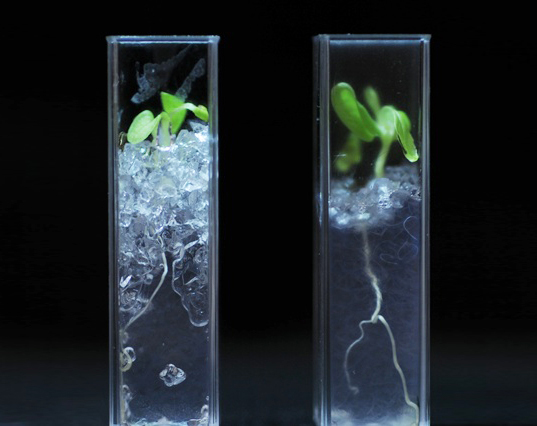 Led by Dr. Lionel Dupuy, Dr. Andrew Spiers, Dr. Tracy Valentine, Helen Downie, and Prof Wilfred Otten, the team of researchers has created a transparent soil that perfectly replicates the chemistry that allows plants to grow. Over a period of two years, the team formulated the composite from Nafion, a synthetic developed by DuPont in the 1960’s which is also currently being utilized in fuel cells. When mixed with a water-based solution developed by the team, the Nafion becomes crystal clear, letting plant roots be seen through glass containers without the interference of obscuring organic matter. “With this new technique, scientists now have a way to observe soil processes, live and in situ. This is exciting because there are so many things to discover in soil and we don’t know yet what they are.” said Dupuy. There are a number of disciplines and industries that could benefit from the use of transparent soil – including crop genetics, the study of plant diseases, and even artistic design. 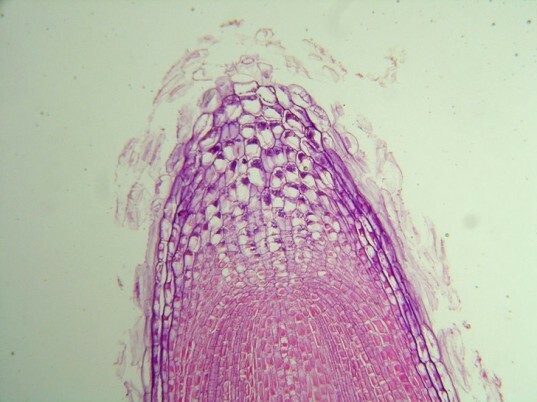 “Physiologists could also use transparent soils to understand how plants or microbes access nutrients that are heterogeneously distributed in soil. Soil ecologists could use this system to make microcosm experiments where observation on interactions of different species can be observed,” added Dupuy. Both practical and beautiful, the discovery promises to shed light on how plants take up nutrients and partner with other organisms. The "rhizoshpere" is the world of plant roots - a region of soil located just below the surface of the earth. It sounds like a fantastical realm, full of secrets and mystery - and to botanists and agronomists concerned with the issues of food security and climate change, plant roots are indeed a subject of great fascination. Yet, when studying dark, underground environments, how can you truly know what is going on under the surface? A team of scientists at the James Hutton Institute at the University of Abertay Dundee in the UK have developed transparent soil that allows researchers to stare deep into the hidden secrets of plants.